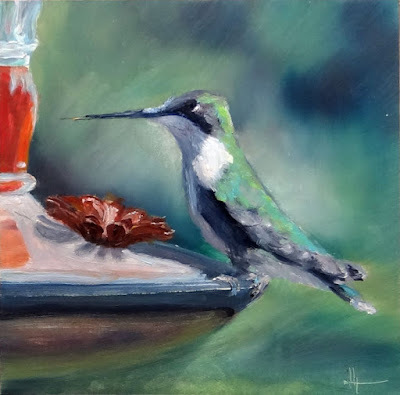 My sister Deb loved hummingbirds so I thought of her a lot while I painted this. Felt good. I like the glass with the nectar in it and the bottom of the copper bowl, but I struggled with that copper flower on the feeder and I am still not happy with it. The lighting on the little bird is realistic and works. My husband took this photo a few years ago -- such a great job capturing it. This one is for you Deb!